THE SHINING (1980). Director: Stanley Kubrick. Cinematographer: John Alcott. 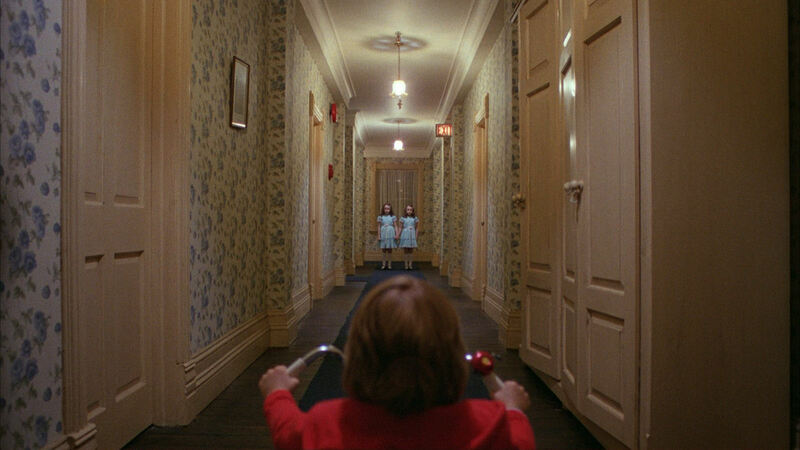 It seems as though every time I see Stanley Kubrick’s THE SHINING, I have a different opinion of it. Sometimes, I look at it and see a work of genius. Sometimes, I see something else. But every time, I see something different. The first time I saw it, it was not a pleasant experience. These days, I think of myself as a mostly sane individual. I have my quirks, like everybody else. But as far as being a rational human being, I hold my own. I can tell fantasy from reality, right from wrong. Having said that, I’m sure there are moments in my youth that for better or worse have shaped me into the person I am today. And more than anything else before it, THE SHINING was the film that messed me up. Though I appreciate all sorts of films, my favorite genre is horror. It wasn’t always this way however. I was one of those kids who couldn’t get within ten feet of a horror film without having terrible nightmares. Remember that one shot in TWILIGHT ZONE: THE MOVIE? The one with the girl who “doesn’t talk much anymore?” I saw that when I was around eight years old. And then I kept seeing it, around every corner, sneaking up behind me when I was drawing or doing whatever. I wasn’t crazy, I just had an overactive imagination and I could work myself into a fright over the most innocuous things. It didn’t matter that I would one day rock out to the music of Cherie Currie. In 1983, she was just a girl who made me quake with terror. My big brother, who enjoyed tormenting me in the way many big brothers do, knew this when he made me watch THE SHINING. And I do mean that he made me. He sat me down in front of that screen and told me not to move. I didn’t really want to see it. But he was bigger than me and when he hit, it hurt. I saw it unfold and was told to pay attention, despite the film being a slow burn of nearly two and a half hours. And then I didn’t sleep through the night for over a year. Every time I would see another TV show or movie, I would risk being reminded of the horror film that was haunting me. Jack Nicholson was everywhere, Shelly Duvall was pitching FAIRY TALE THEATRE and Scatman Crothers’ presence could be felt not only in many films but even in my Saturday morning cartoons. I worked myself into such a frenzy that I was even briefly convinced the people behind the making of that film were up to no good. They would have to be, in order to create something that would terrify an impressionable child so completely. It all seems so silly now, but keep in mind I was only eight or nine years old and like I said, very imaginative. Naturally, as I grew up, I got over my fear. My big brother matured himself and figured out things to do that didn’t involve tormenting his younger sibling. I tried to keep as much imagination as I could, but I no longer saw the figures from the movie screen lurking in the shadows. Jack Nicholson was one of our most talented actors. The most evil thing Shelly Duvall ever did was get those horrible songs from POPEYE stuck in my head. And Scatman Crothers? He’s the most wonderful of all. He was Hong Kong Phooey, for crying out loud! I even got into horror films, as you are well aware. I started with ALIEN, still one of my favorite movies. I saw that thing all the way through, every day for a solid month. This was a new kind of scare, one that I could harness and gain excitement from. And there was always the logic that even if these creatures did exist, they were a million light years away. The same thing happened with JAWS. Right away, I knew that was a great movie and I saw it multiple times. Sharks are real? Fine, I never liked going in the ocean anyway. And of course it just grew from there. I not only learned to appreciate all things horror, I learned to embrace it. The cathartic feeling gained from these films was liberating. The fear that once imprisoned me was now the very thing that set me free. Around the time I was fifteen years old, I watched THE SHINING again. The terrors of my youth were so far back that I knew they would not resurface. When I watched the film on that muddy old VHS transfer, I understood why so much in the film would leave an impression on me. But honestly, I could only shake my head, laugh and even yawn. I mean, 144 minutes of this? It does kind of drag, doesn’t it? I have now told you what I thought of THE SHINING during my first and second viewings. I have seen it five or six times since then. And every time I have seen something different. I have marveled at the Steadicam work by Garrett Brown. I have been amazed by the attention to detail Stanley Kubrick gave this and all of his works. Sometimes I have found fault with the film, other times I have found none. I suppose one of the amazing things about THE SHINING is I always see something different, based on where I am in life. And I’m not the only one who has seen their opinion change. 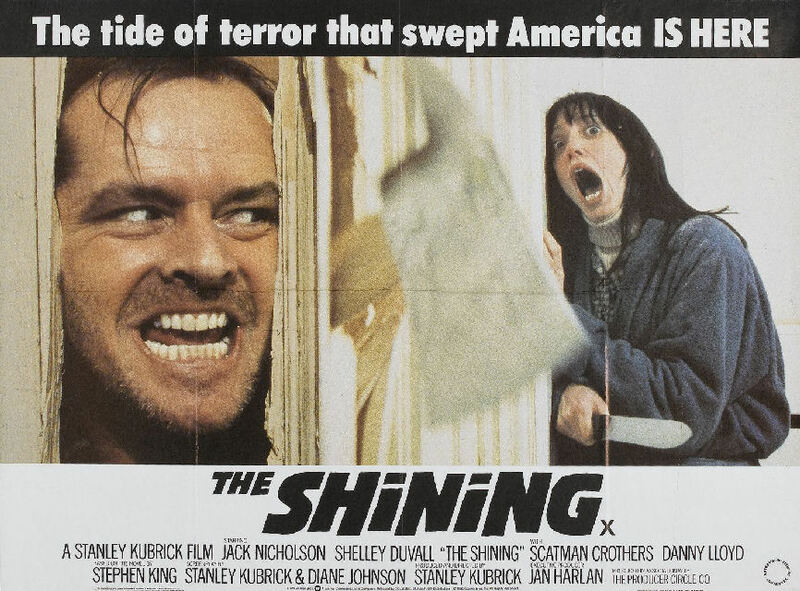 It’s hard for people to imagine now, but when THE SHIINING was released, it was seen as Kubrick’s biggest blunder. Critics felt the director was more interested in playing with the recently invented Steadicam than telling a coherent story. They felt the film was an overlong, pretentious slog for a story that basically boiled down to a father turning on his family. The initial response was so bad that at the very first Razzie Awards, Kubrick was awarded Worst Director. Of course, the Razzies lack any credibility. They are more interested in harping on trends than noting any real merits of film. And that’s what happened here. 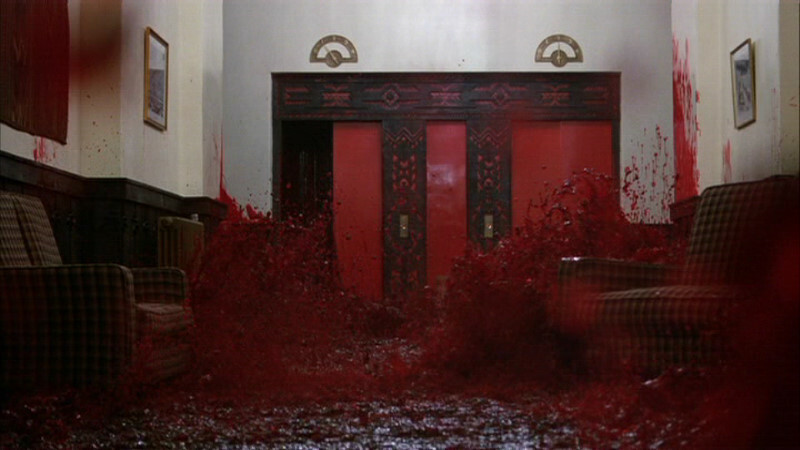 When THE SHINING was released, people reacted negatively. It would be many years before its reputation would improve. I watched the film again for the purposes of this review, and once again I saw something different. I fully appreciated Kubrick’s brilliant directorial flourishes. With his cinematographer John Alcott, he is able to create a depth of field unparalleled by any other director since Welles in his prime. 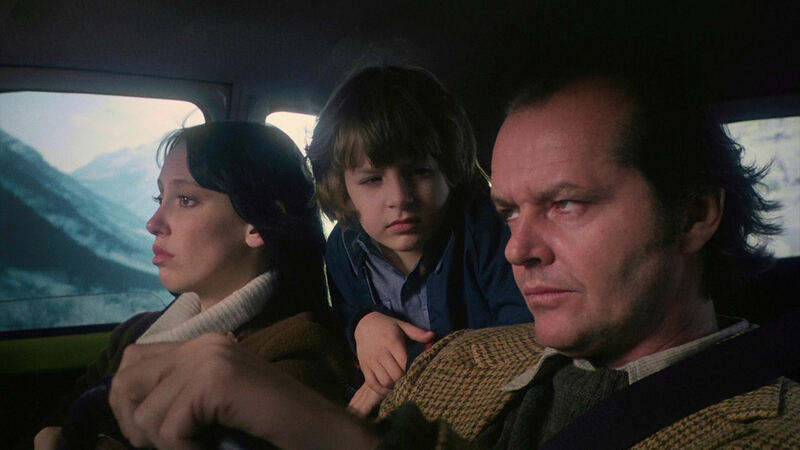 There is a sense of isolation and claustrophobia in the Overlook as Torrence works desperately on his novel while Danny pedals aimlessly on his Big Wheel and Wendy tries to occupy her time any way she can. By this point in his career, Jack Nicholson was already known for playing characters who if not crazy, were certainly quirky and flamboyantly eccentric. This can be seen in EASY RIDER, FIVE EASY PIECES and ONE FLEW OVER THE CUCKOO’S NEST. If you’re going to be especially particular, it can even be seen in his LITTLE SHOP OF HORRORS cameo. None of these characters were the same, but none of them were lacking in serious psychological issues either. Nicholson is an incredibly talented actor with a wide range, but no one did crazy better. And that’s the problem. Think back and you’ll discover that there is no moment when we get a sense that Jack, Wendy and Danny are a functioning family. There is no simple scene of them having a day out together or even of them making casual conversation over the dinner table. The closest we get is in the car ride up to the Overlook and that hardly counts. The conversation topic is the Donner Party and Jack Torrence’s dialogue is dripping with sardonic wit. Right away, Jack is at odds with his own family. They have a great love for him, but he does not exhibit any behavior to suggest he feels the same. I felt like there was a part of the character that was tempted to drive them all off a cliff then and there. This is also a point of Kubrick and Johnson’s screenplay. In an early sequence, Wendy has to reveal to a pediatrician the accident that caused Danny’s childhood injury. She chooses her words very carefully, but she is describing her husband hurting her child while in a drunken rage. She is visibly shaking as she tells the story and the unattended cigarette she is holding is burning in her trembling hands. This sets up the problems in the Torrence household, but it seems as though we are supposed to believe things are on the mend. Jack has quit drinking and is trying to get his family back into a decent living situation. It seems like Jack feels an obligation to his family, but only in so much as that is what you are supposed to feel. In traditional roles, the man is supposed to provide for his household and with the family dynamic being the way it is, it seems Jack believes in this. But I never sensed he had an ounce of genuine compassion towards his family. They instead were an albatross around his neck. At one point, he tells the apparition of his bartender that he loves his child, but it is said with sarcasm, bitterness and resentment. The only moment he shows real human emotion is probably my favorite scene of the film. It’s when Jack wakes from a horrible nightmare, a nightmare in which he kills his wife and child. He is moaning and crawling on the ground, dripping with sweat and telling Wendy it’s the worst nightmare he ever had. It’s the only clue that he placed any true value on his family. Jack Torrence seems unhinged from the moment he gets to the Overlook. It seems as though only a few days have passed when he’s staring out the window with a look on his face that says sanity has fully checked out. Thus, even though we are given title cards to document a passage of time, the passage of time is meaningless. There does not seem to be a progression to his insanity. He starts out crazy and stays there. The only difference is the insanity becomes more and more externalized. This would be all well and good if this is the point Kubrick was trying to make – that the Overlook was merely a vehicle for his mania and nothing more. But we always sense that there is an influence goading him onward. The ghostly figures in the hotel are not bystanders in this affair, they are not even participants. They are the driving force behind Jack’s deterioration into lunacy. Therefore, the story isn’t served by not showing him losing his humanity gradually or unwillingly. 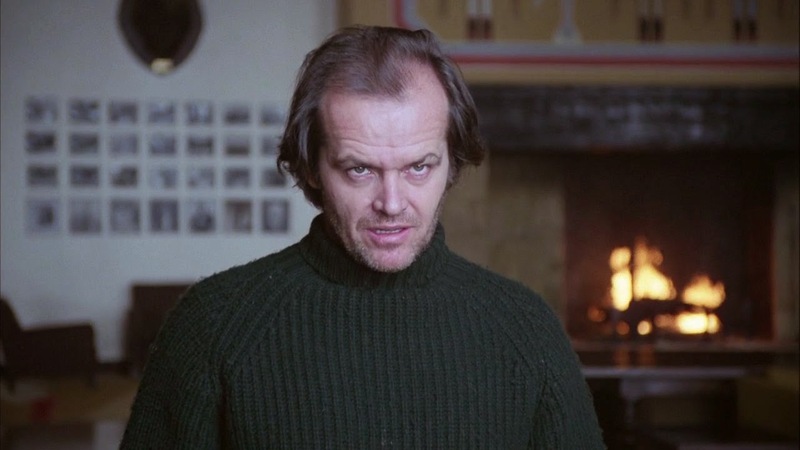 As hard as it is to imagine THE SHINING without Nicholson, I kept wondering if the character would have been more believable with anyone else in the role. I may have found one glaring problem in this latest viewing, but it’s a testament to the film’s strength that it is able to withstand it as well as it does. This is neither the most positive nor the most negative experience I have had while watching this motion picture. Regardless of how much I enjoy THE SHINING on each viewing, the film is never forgettable. Like so many of Kubrick’s other films, I can’t shake its imagery for days afterward. Those images stay engrained in my brain, like the ghostly apparitions that haunt the Torrence family. Lord only knows what I’ll see on my next trip to the Overlook Hotel. Recommended.